Imagine that you’ve just returned home after being deployed to the American Red Cross Hurricane Sandy disaster relief operation. 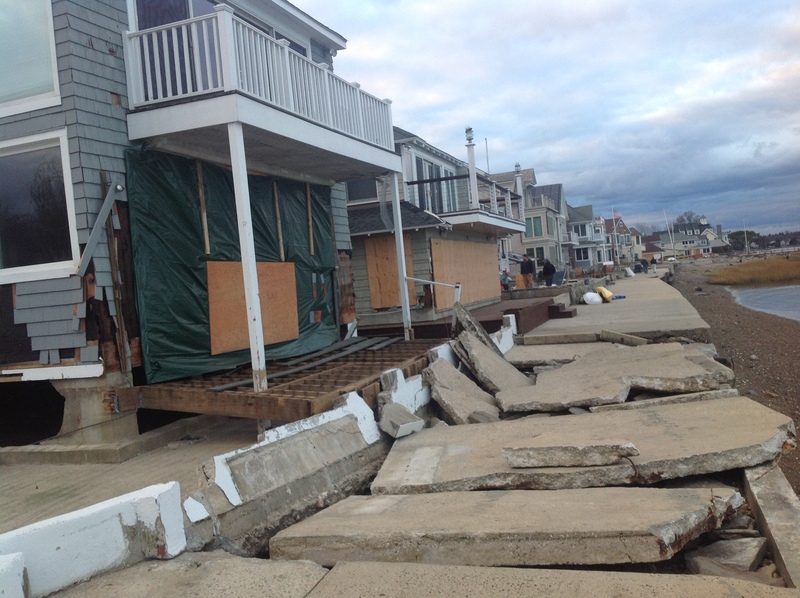 You worked twelve-hour days for three weeks helping Sandy survivors rebuild their lives. You’re a Red Cross disaster relief worker–most likely you’re a volunteer. You’re exhausted. You’ve seen a lot. Your experiences range from the devastating to the inspiring. You could use a little emotional support, but you’re not sure how or who to ask for it. 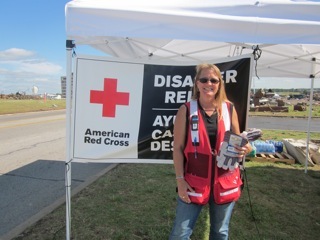 Sandi Lindgren was deployed to the American Red Cross tornado disaster relief operation in Joplin, Missouri, May 2011. Photo provided courtesy of Sandi. The next thing you know, you receive a call from a Red Cross Disaster Mental Health volunteer who’s checking in to see how you’re doing and to assist you in dealing with stress and high impact experiences. The volunteer listens to you, offers support and lets you know that you’re not alone. Sandi Lindgren could be the person who calls. 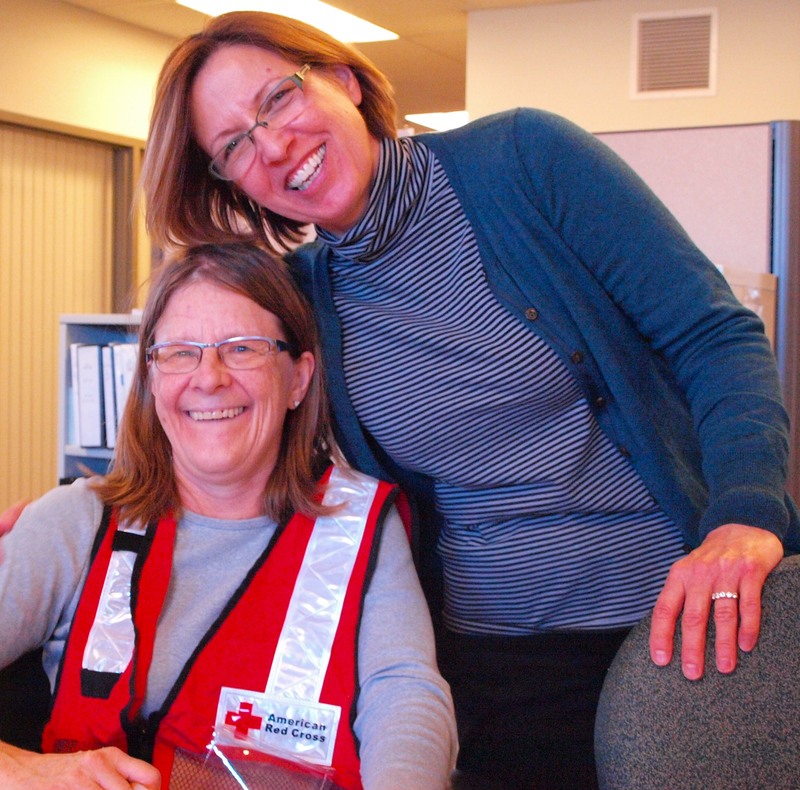 Sandi–who also deploys to disaster relief operations away from home–most often serves the Red Cross in Minnesota as part of a team of trained and licensed mental health volunteers. Together, the team has made more than one hundred post-deployment calls to Hurricane Sandy relief workers from Minnesota. 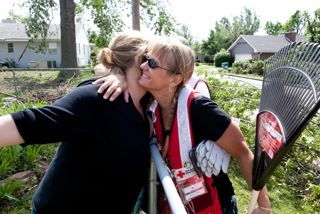 Sandi Lindgren gives–and gets–a hug during the tornado disaster relief operation in Joplin, Missouri, May 2011. Photo provided courtesy of Sandi. Thank you to all of the Disaster Mental Health team volunteers for your compassionate support of our regional volunteers. Your work is truly appreciated. Story by Lisa Joyslin, Volunteer Resources Director, American Red Cross Northern Minnesota Region. Click here to learn more about Red Cross opportunities. 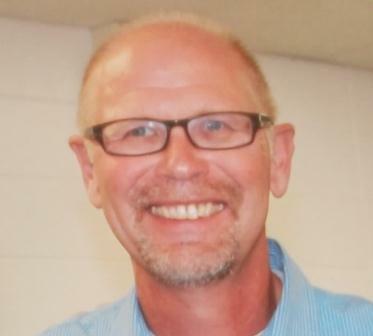 Jim Mehle became an American Red Cross volunteer this past February. Now, only a few months into his volunteer service, Jim is on-the-ground in New York City helping with the ongoing disaster relief response following Hurricane Sandy. “I had no idea that my first assignment would be responding to one of the biggest storms to hit the United States in recent months,” says Jim. Red Cross disaster response volunteer Jim Mehle. After retiring in 2012 from his job as a psychiatric social worker in a minimum-security prison, Jim heard about volunteering with the American Red Cross through word of mouth and decided he’d give it a shot. Since arriving in New York City, Jim’s been busy. Mostly he’s worked with one of several American Red Cross call centers serving as hubs for communication. Call centers gather damage information in specific geographic areas, record the number of calls centers receive each day and manage casework data entry for individual Red Cross clients. The call center provides Jim with his daily client list. Each day he works with 4 clients who’ve reached out to the Red Cross call center for help. Jim meets them in their neighborhoods where he sees the damage first hand. 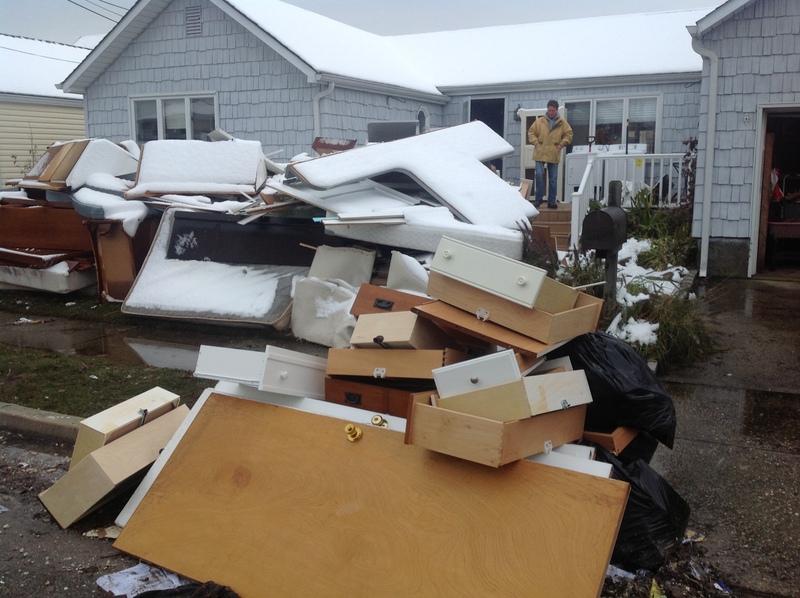 Among those Jim visited was a 61-year old man whose home of 40 years was destroyed on Staten Island. Currently, he’s staying with his son. He hopes to rebuild his home, but starting over after 40 years will likely be a difficult task. “Your heart just goes out to these people,” says Jim. Story by Hayes Kaufman/American Red Cross. 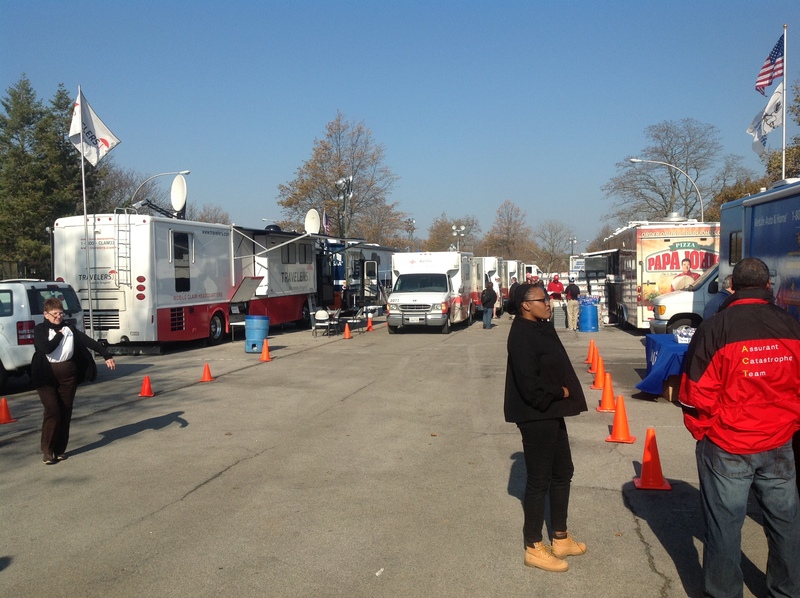 Click here for more about Red Cross helping Sandy survivors. Red Cross responder Sue Buelow is back from New Jersey where she helped with Superstorm Sandy disaster relief efforts. Below, Sue looks back. The very beginning was a lot of trying to figure out the response system and getting used to hurry up and wait. But soon after arriving I was assigned to supervising special field teams doing “seek and serve” emotional support and traveling to Moonachie, Newark, Jersey City, Toms River and nearby damaged communities. 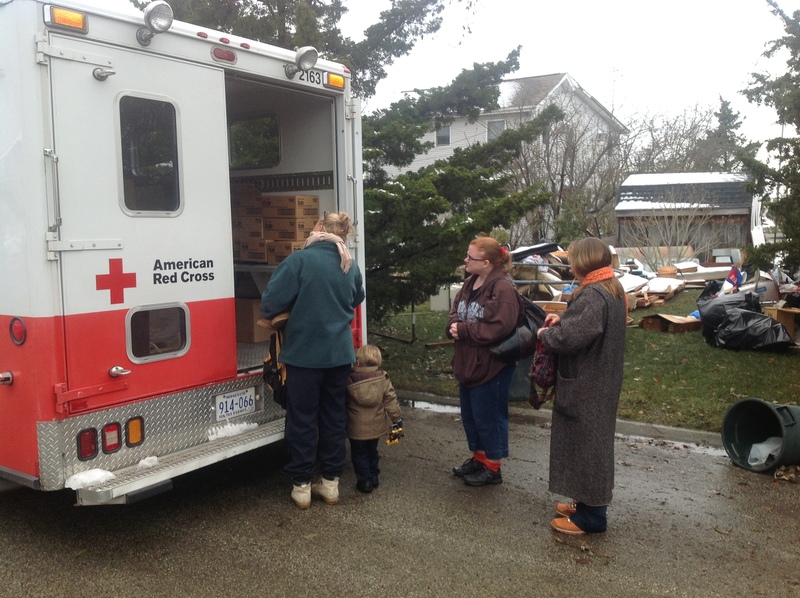 Sue Buelow (l) and Lizzie Kampf (r) while responding to Superstorm Sandy disaster relief in New Jersey. I learned a few things along the way: 1) speed limit signs are a suggestion, 2) many cities are not on a map, 3) there are few places that allow left turns, 4) be thankful for clean clothes; and 5) they love Minnesotan accents there! The work was hard emotionally and physically. My first partner had to return home to California for health reasons. Then, for the next 12 days I had the pleasure of partnering with Lizzie Kampf, a new “just-in-time” disaster mental health responder who was also from the Twin Cities. It felt like we’d known each other a lifetime. I was sad to see Lizzie leave before I finished my final week there. I didn’t know what I’d do without her driving the truck — she took on the persona of a New York cab driver quite naturally. Being there when the residents saw their condemned or empty lot of debris was indescribable as they collapsed into my arms, sobbing and needing a “Minnesota hug.” We helped look for mementos in the debris, from small things to stones of a child’s hand and foot prints. We were there for those in shock who couldn’t think to pack up some clothes. Listening to them tell their stories and showing us their homes or pictures was moving. I certainly have received a great gift from the same people: I believe I have helped them. I am blessed to have had a small part of their lives and in their recovery from this disaster. I will always remember my time spent there. Sue returned home a few days ago. 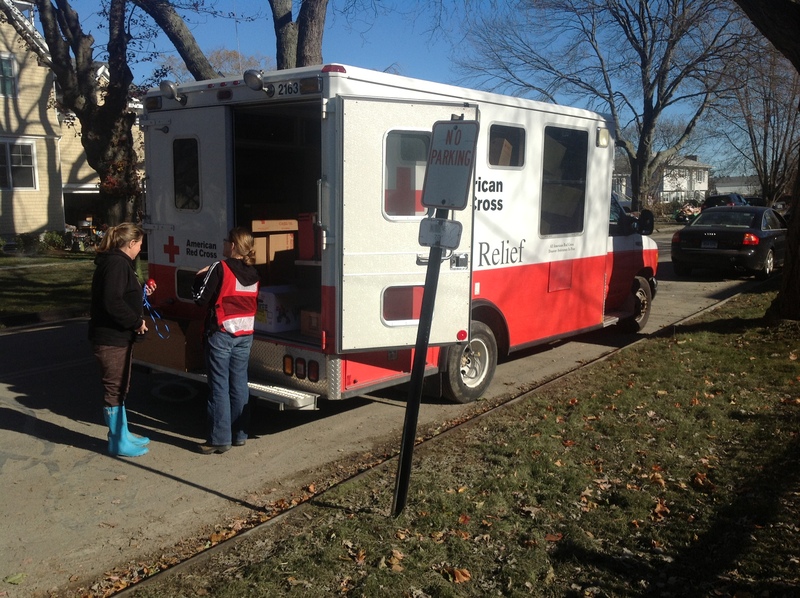 She is among more than 100 Red Cross disaster relief workers (mostly volunteers) from Minnesota who have responded to Sandy. I’m halfway through my third week on this operation. I started in Mass Care Sheltering, and was sent to manage a shelter in Glen Cove, Nassau County, Long Island during and immediately after the storm. I had the chance to work with some fabulous people there. Our shelter population stayed small, ranging from 3 to 18 residents, but many community members stopped by during the day to charge their phones and to escape their powerless and increasingly cold homes. A group of Seniors joined us to eat one afternoon (this was a few days into my super effective all-cold-sandwich diet), and they had so much fun that several of them registered as shelter guests and proceeded to stay up all night laughing, chatting, and watching DVDs. Later, some shelter consolidation took place and I joined the staff of an 800-resident mega shelter at the Nassau County Community College just before Election Day. The state Board of Elections brought in absentee ballots for the residents, and Best Buy provided TVs, computers and WiFi hotspots so they could follow the election results. (Over at the staff shelter, we were all just exhausted and went right to sleep.) The mega shelter had many other amenities as well: a free laundry service, a medical clinic, a cell phone charging and loan station, and a supervised children’s play area. Nevertheless, a population that large is chaotic. Several residents were transferred to hospitals, including one in full labor who gave birth to a baby boy (+1 to shelter count since Mom was still registered!). After two weeks in Sheltering I transferred to Client Casework, which is based out of Operation Headquarters at the New York City Red Cross office building. I’ve been on Staten Island for the past few days representing the Red Cross at a FEMA Disaster Recovery Center near the shore. There was a tremendous amount of damage there, and our presence seems meaningful as a validation of the incredible loss the community has suffered. I am being sent to a different area tomorrow, as I am among the fearless and possibly foolish few who are willing to take on New York City driving, and another team’s driver is having a day off. Traffic here is truly abysmal, as some of the tunnels remain closed, and many streets in Lower Manhattan are clogged with recovery trucks and trailers. But that’s only half the fun: New York City drivers are an aggressive lot. I’m working on my swerve technique in hopes that defensive driving becomes an Olympic sport in Rio in 2016. Hope to see you all soon back in Minnesota. Red Cross volunteer Kris Posey (right) helps get other volunteers, including Lori Olsson (left), quickly and safely out the door for disaster response. Question: Who are those people working tirelessly to get Red Cross relief workers deployed to disaster locations, such as Superstorm Sandy? Answer: They’re Emergency Services Staffing volunteers! In the case of our American Red Cross Northern Minnesota Region, we’re talking about volunteers Kris Posey, Susan Waananen & Cari McCollor. Although they’re often not working on the ground in affected disaster areas, they’re working hard to get those who are responding in the field out the door quickly and safely. Emergency Services volunteers work behind the scenes 24/7 when disaster occurs. They’re in the Red Cross offices on weekends monitoring email, helping arrange training and processing volunteers. They’ve been doing this nearly every day since before Superstorm Sandy made landfall on the East Coast. 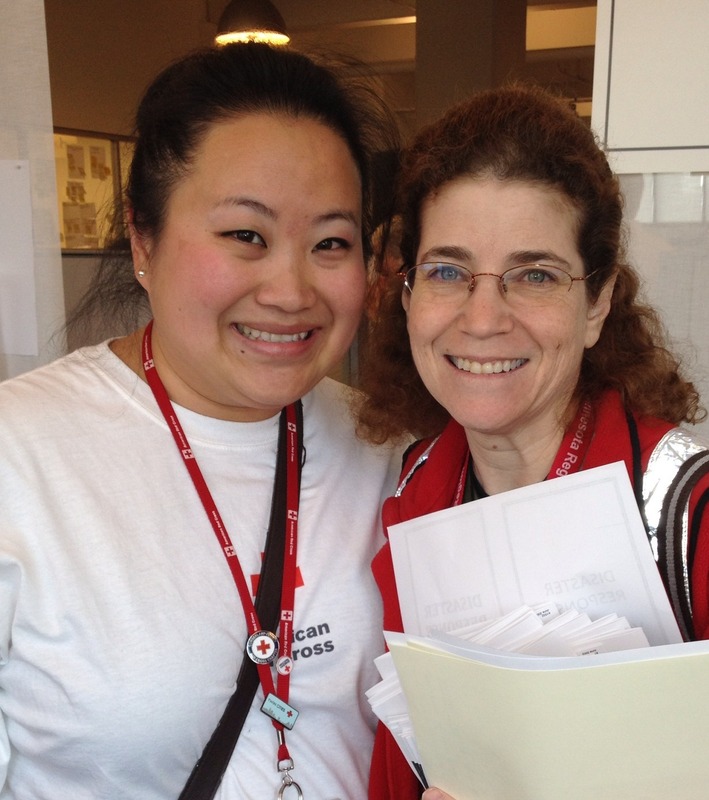 Every day, they return calls and answer emails that come in from our 700+ volunteers across our Red Cross region. 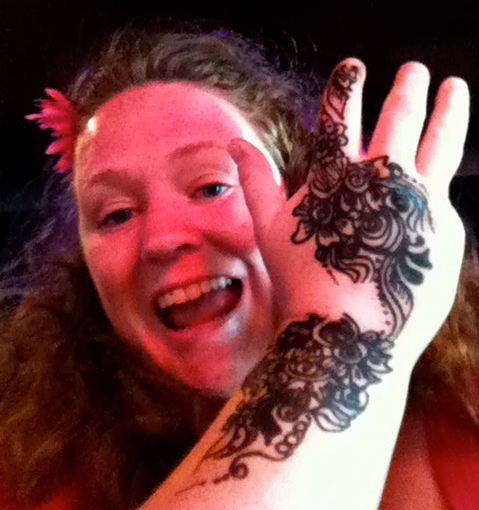 Hey, Cari, we like that henna tattoo! In addition, we’ve had staff services volunteers in the office these past few weeks learning all there is to know about national deployment. Thank you Steve, Marcia, Lois, Bonnie, Barb, Jan & John. We’re building great capacity throughout our region. Thank you to Emergency Services staffing volunteers. You help make our mission happen. And we love you for it! P.S. Emergency Services staffing volunteers also deploy to disasters. 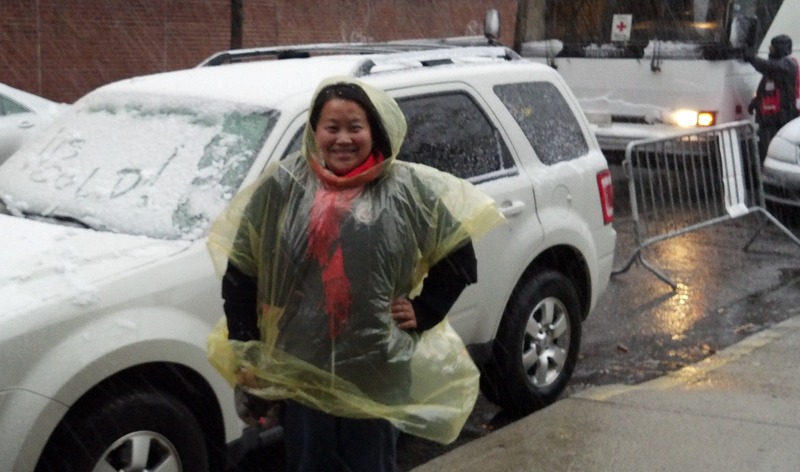 Cari (pictured) is now on the East Coast working as part of the Red Cross field response to Superstorm Sandy. Return home happy and safe! 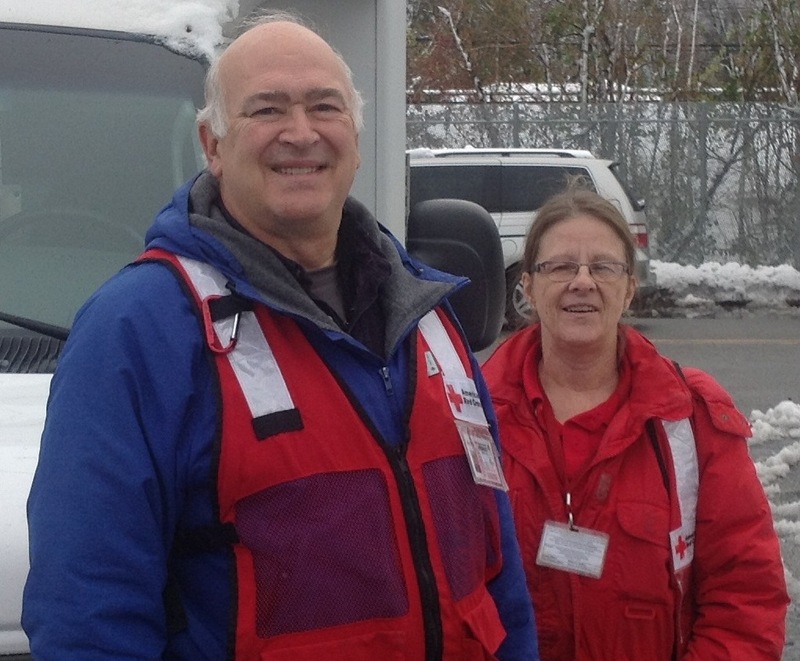 Red Cross volunteers Sheldon Bruce and Lori Olsson deployed to Superstorm Sandy days ago–how many? (Too many to remember.) 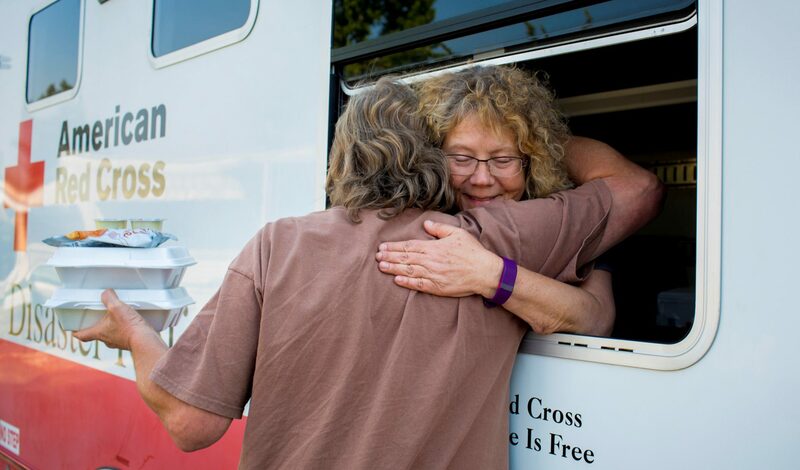 They drove a Red Cross emergency response truck 1,200 miles from Minnesota to New York and since then they’ve been busy handing out hot meals and relief supplies to people in devastated areas. We’re grateful for the work that Sheldon and Lori are doing. Here, through Sheldon’s eyes, we share with you a bit of what they’re experiencing. 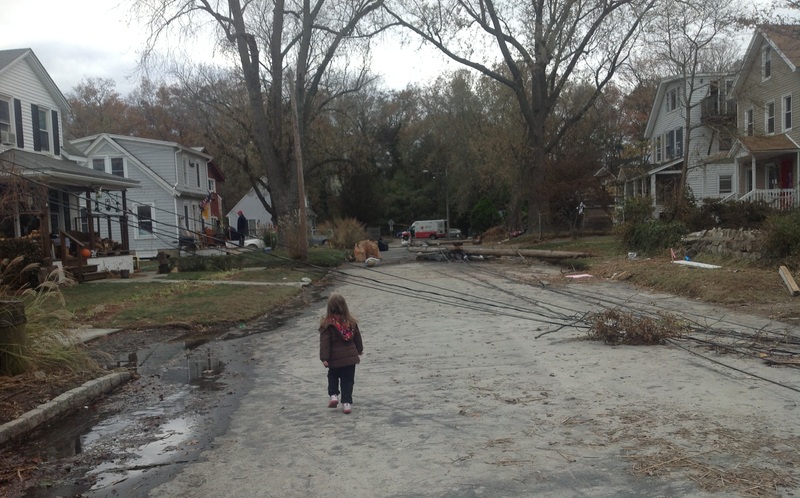 A street after flood waters receded. Families wait for meals and supplies from a Red Cross disaster relief truck. 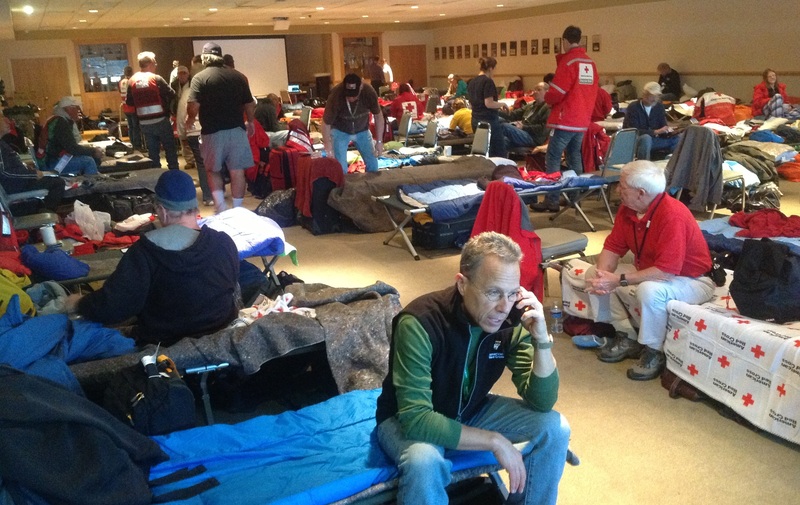 Red Cross disaster relief workers at their temporary home-sweet-home accommodations. 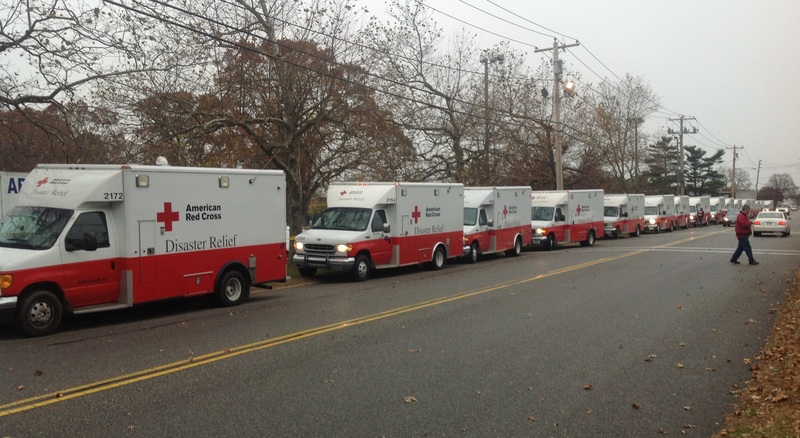 Red Cross trucks waiting to refuel. Clean out after the flood. Delivering clean up kits in affected neighborhoods.